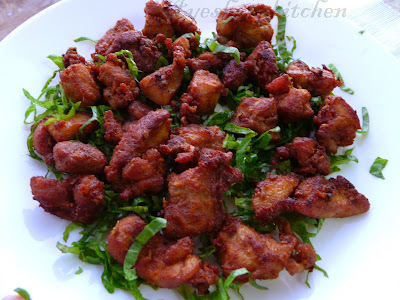 Chicken 65 is a spicy crispy juicy chicken dish originated from Chennai. 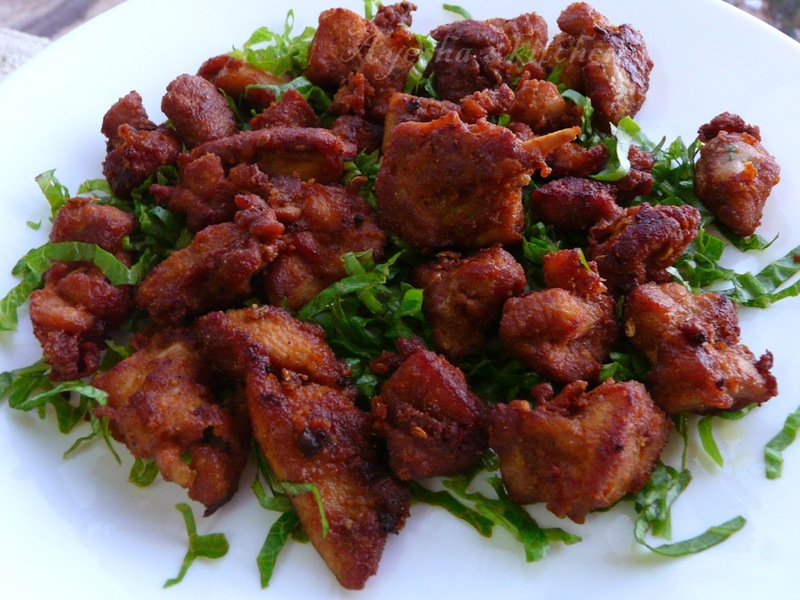 This is a delicious deep fried chicken with a mouth watering aroma of curry leaves and the spices. Chicken 65, the most popular starters in Indian restaurant menu is a classic dish which is enjoyed by all age people equally. Do try this recipe at home and for sure kids and adults will love this and will crave more for this aromatic spicy dish. In a bowl mix in turmeric powder, vinegar, curd, red chili powder, fennel seed powder, corn flour, rice powder, gram flour ( or can use all purpose flour), ginger garlic paste, tomato sauce, white pepper powder (OPTIONAL) and salt. Make a very thick paste. Do not add more water and the consistency must be thicker than idly batter. You can mix this in a blender which will give an excellent texture. For best result, each chicken pieces must be fully covered with this thick flour batter and now mix the beaten egg with the marinated chicken pieces. Now put each marinated chicken pieces into the oil and deep fry. Do not over crowd the chicken in the oil. Check occasionally. Do not over fry the chicken. When done transfer to a strainer. Garnish with finely sliced coriander leaves.